India has one of the highest ‘net savings rates’ in the world (the national saving rate is about 20 per cent of GDP). However, the net savings rate as a % of GDP has been steadily declining since 2011-12. The other day, I was going through the IRDA’s annual report and noticed that the Domestic saving declined to 29.6% of gross national disposable income (GNDI) in 2016- 17 from 30.7% in 2015-16. ‘Household financial saving’ – the most important source of funds for investment in the economy declined to 6.7% of GNDI in 2016-17, down from 8.1% in 2015-16. 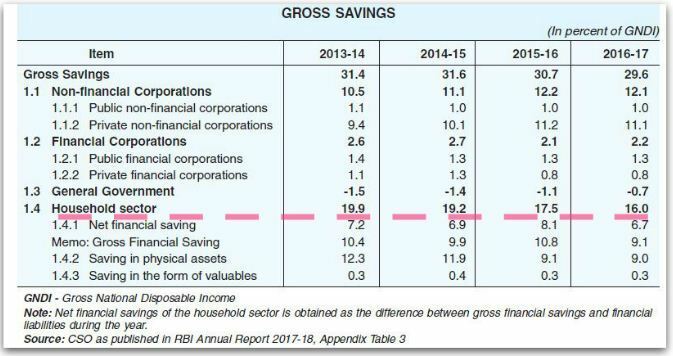 The below table indicates that the ‘Gross Savings’ of Indian Household sector has been on the down-ward trend. As per the estimates by the RBI, the rate of financial savings by the Indian households have again picked up in 2017-18. As per the above data, the savings in Deposits have declined considerably and we preferred to keep the savings in the form of ‘currency’. You can also notice that the financial liabilities of the households have increased. Considering this scenario, each rupee that you can save is valuable, more than that ‘where you save’ is what matters the most. This has prompted me to publish a post that lists all popular investment options that are available in India. Coincidentally, one of my blog readers have also requested for a similar article. Let’s now discuss on popular investment avenues that are available in India. For simplicity sake, I have segregated the investment products in four categories. Kindly note that this article is not about ‘best investment options’ but to highlight the important features of popular investment products, so that you can select right investment option(s) that are suitable for your financial goals. Below are some of the top investment avenues that are safe or have low risk. These are Fixed income or Debt oriented products. The rate of interest vary from bank to bank and it also depends on the quantum of investment, your age and deposit tenure. You can get tax benefit u/s 80c by investing in a 5 year Fixed Deposit. TDS is applicable. You can submit Form 15G or Form 15H (if eligible) to avoid TDS. NCDs are fixed income products that come with slightly higher risk when compared to FDs/RDs. These are one of the most popular investment options in the recent past. NCDs offer slightly better interest rates than Fixed deposits. These are suited well for low-risk & conservative investors. Kindly note that interest income is taxable. TDS is not applicable on listed debentures. TFBs are also one of the safest and low risk investment product. The interest income is tax-free. The coupon rates offered on these bonds are generally lower than NCDs. In this FY, there are no TFB Public Issues are proposed. You may have to buy them from Secondary market only. Though the interest earned on these bonds is tax-free, any capital gain from sale in the secondary market is taxable. These are one of the best savings options for the Individuals who fall under highest tax slab rate and are conservative. Company Fixed Deposit schemes generally gain popularity in low-interest rate scenario. The interest rates offered on Corporate FDs are better than traditional FDs. Interest income is taxable. TDS is applicable on interest income of above Rs 5,000. This is an Indian government-sponsored investment scheme and hence is considered to be one the safest and most reliable investment options for the Senior Citizens in India. The maximum amount that can be invested in this scheme is Rs 15 lakh. The interest income is taxable. The interest rate on SCSS is generally better than FD rates. Tax benefit u/s 80c is available. TDS is applicable on interest income of above Rs 10,000. You can submit Form 15H to avoid TDS. It has a tenure of 5 years but premature withdrawals are allowed (subject to certain terms). This is one of the best periodic income product. You can receive interest income on monthly basis. But, interest income is taxable. PO MIS has a tenure of 5 years. This is a girl-child oriented scheme offered by the Govt of India. The minimum amount that can be deposited in SSA is Rs 250 only. The interest rate offered on SSS deposits is now market-linked. The maturity of the account is 21 years from the date of opening of account or if the girl gets married before completion of such 21 years (whichever is earlier). However, pre-mature withdrawals from SSA are allowed. This is a decent long-term savings option for your girl child. In the below section, let us go through the features of some of the popular Govt sponsored Pension oriented schemes and Provident Fund Options. The GoI bonds carry an interest rate of 7.75% with a lock-in period of 7 years. Premature withdrawal facility is available to the eligible investors after lock in period of 4, 5 and 6 years in the age bracket of 80 years and above, between 70 to 80 years and 60 to 70 years respectively. Indian Citizens aged 60 years and above are eligible to invest in PMVVY. The scheme has been extended up to March 2020. As per Budget 2018-19, the maximum investment permissible has been increased to Rs.15 lakhs for a monthly pension of Rs 10,000. One time premium payment of around Rs 1,50,00/- fetches a monthly pension of Rs 1,000 for 10 years. No tax benefit is available. Under the APY scheme, a guaranteed minimum pension of Rs. 1,000/-, 2,000/-, 3,000/-, 4,000 and 5,000/- per month will be given from the age of 60 years depending on the contributions made by the subscribers. Pension is a taxable income. Tax benefit u/s 80CCD is available. The Government of India rolled out the National Pension Scheme (NPS) for all the citizens of India from May 1, 2009 and for corporate sector from December, 2011. National Pension System (NPS) offers two types of accounts – Tier I and Tier II. Income Tax benefits are currently available on Tier-1 deposits only. The NPS works like mutual funds. The returns are variable based on the Fund/Scheme chosen by the subscriber. At present, 40% of the accumulated corpus utilized for the purchase of the annuity is tax-exempt. Of the remaining 60% corpus withdrawn by the NPS subscriber at the time of retirement, 40% is tax-exempt and 20% is taxable. The tax exemption is now extended to the entire 60% (w.e.f April 2019). The annuity income generated by the Annuity plan is taxable. If you take out your monthly pay-slip and check, you can understand that every month 12% of your “salary” is contributed towards EPF account. Your total monthly contribution is routed towards Employees’ Provident Fund. The rate of interest is notified by the central government periodically (every fiscal year). PPF is one of the best long-term savings options in India. The interest rate is now market linked and is generally better than most of the other fixed income and safe investment avenues. The Deposits have a lock-in period of 15 years and can be extended in blocks of 5 years each. Let us now review the features of mutual funds and direct equities. Mutual Funds are slowly gaining tremendous popularity with the retail investors. One can start investing in a Mutual fund with a very nominal investment. Mutual funds are suited for all types of Financial goals and investment horizons. But, kindly be aware of the risks associated with mutual fund investments. The gains on Mutual Funds are treated as Capital Gains. Depending on the type of mutual fund (Debt / Equity) and the holding period (Short term / Long Term), the capital gain taxes are applicable. Close-ended schemes like FMPs (Fixed Maturity Plans) come with lock-in periods. You can also receive Dividend income from your Mutual Funds. Investments in Equity oriented ELSS funds can get you tax deduction u/s 80c. TDS is applicable on NRI investments. Tax @ 10% on long-term capital gains of above Rs 1 lakh is levied on Equity Funds. 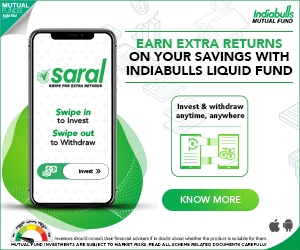 Best Equity Mutual Funds to Invest now! Equity Mutual Funds are an indirect way to take exposure to stock markets. In case, you can stomach more risk, you can consider investing in Stock markets directly as well. Managing your emotions (financial behavior) play an important role when it comes to equity investments. In the next section, the features of Real estate property and Gold investments are provided. If you can afford to take high risk and big-ticket investment, can consider investing in a real-estate property (other than your self-occupied property). The ideal rental income yield to expect should be above 4%. TDS @ 1% is applicable on an investment of above Rs 50 lakh. TDS rules are also applicable on NRI investments. Gold prices have become very volatile in the last few years. It is no more the safest asset. But, you can easily ‘sell’ (high liquidity) at the prevailing market prices, as GOLD is the ultimate form of money in the world and is “universally acceptable”. But, do not expect abnormal returns from your Gold investments. If you HAVE to invest a portion of your savings in Gold for long-term, Gold bonds outscore the Gold funds / physical gold and can be a preferred mode of investing in Gold. Our culture and tradition encourages us to save more. But, we are also extremely risk averse and generally place greater importance on safety than rate of return on investments. If you would like to accumulate sufficient corpus for a long-term goal, you may have to take calculated risk and invest in right financial product(s) which can beat inflation & give better tax-adjusted returns. If your investment horizon is short, kindly give high priority to safety & liquidity and do not chase returns aggressively. Your investment portfolio should have a fair mix of both conservative as well as aggressive investment options. Kindly try to maintain an ideal asset allocation. Request you to let me know if any of the details provided in the above Tables (images) needs to corrected or updated. Cheers! The returns quoted in the above tabular data are indicative only and they are not guaranteed. The investment horizons mentioned in the above post are for IDEAL scenarios only. I believe that investment and insurance should not be clubbed together and hence Insurance investment options like ULIPs, Traditional life insurance plans and Pension plans are not included in this article. Thank you so much for providing your valuable inputs. 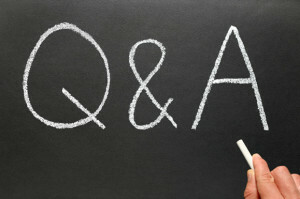 I have few queries need your valuable guidance. 1. I would get some money (8 lacs) which I would like to invest in corporate bonds to get monthly interest which finally to invest in MF’s for better returns. Can you pls suggest is it good idea or else can you suggest any other tool which can give more than 9 % return (monthly). Else I have max gain home loan with interest rate 8.9 %, is it good to park it. Definitely more than 5 years, in fact this is for capital building. Pls also note I have SIPS for 35 k.
I have SIP in icici pru value discovery fund 3000 for last 3 years, returns are poor, can you pls suggest to continue or divert into any other? If your investment objective is to wealth accumulation then any reason for planning to pick Bonds that may monthly interest?? You may invest in mutual funds or other options for corpus accumulation. You may kindly share your MF Scheme names.. The idea is to invest in SIP’s from the interest obtained on corporate bonds. At the same time don’t want invest in lump sum in MF’s. Moreover, I feel, we get more than > 9 % interest in corporate bonds. I appreciate you to suggest any other options available which is suitable to my rudiments. As already mentioned I have home loan @ 8.9 %. Icici value disc – 3 k investing last 3 y, low return, should be continued? Sundaram mid cap -2k. I can add another 10 k, pls suggest. NPS is also there for around 1.5 lacs p/y. Corporate Bonds – Are you referring to Debentures or Debt funds or ?? You may continue with your ICICI Fund. Reliance Hybrid is not a great performer. You may invest in HDFC hybrid fund itself. Most of the new-age (latest) ULIP plans are almost same, just they bundle some new features (value added ones). But, I prefer to pick Mutual funds to ULIPs. Sir,I am now 30 age, got married . In a couple of months I will go abroad and we planning to stay there for next 15 -20 years or more .I have some equity mf schemes in mind for long term purposes (I will share it with u later) , but now in a great confusion whether to start a PPF account or NPS before becoming NRI.. In my knowledge, 1 }ppf- it is completely tax free but heard that Govt planning to implement new rules for NRI. 2} NPS- Tax is on withdrawal amount and there is compulsory to buy an annuity..
PPF is a good long-term savings option. If PPF account is opened by a Resident Indian and later on if he/she becomes an NRI, can still continue his contributions to PPF account for the full 15 year term. But, recently there was a notification by the Govt that NRIs should close the PPF accounts. This notification was later withdrawn. So, there has been policy flip-flop w.r.t PPF by the Govt. 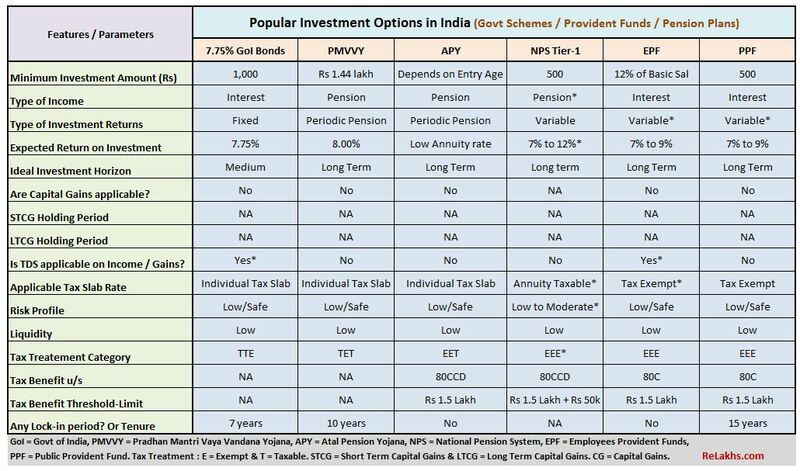 * National Pension Scheme (NPS) – Why it is not a good Investment Option? You are welcome! Keep visiting ReLakhs.com..
why every financial blog relate real estate with house only, why not land, commercial property etc, I have seen only of your article where your parents have invented in a land and benefited immensely and you have boasted about long term nature and effect of compounding in that article. 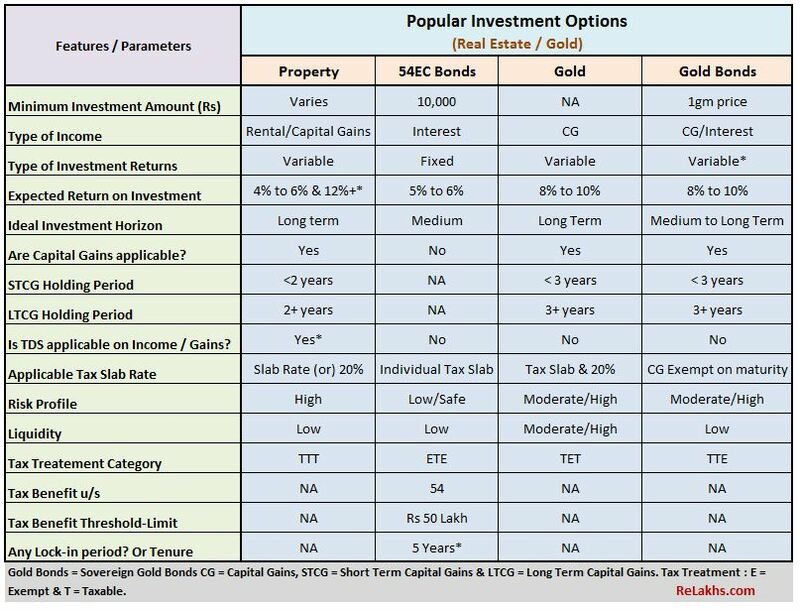 Can you do article on real estate which shows ideally if a Rs 1 lakh invested it should become x by so many years (y) to have better returns than any product like FD or MF or NDC etc this will help people to compare if their real estate investment is correct or needs some correction, this will also bust myths of investing in realestate is great etc. For most of the real estate reviewers, real-estate means FLATs/Apartments. Yes, RE is much more than that..
May be, we have reliable data only on Flats hence the analysis by most of the reviewers is done on Flats only. I am strong believer that an investor who can afford to take risk can also consider RE as an investment option (especially land/independent house). I do not like to invest in Flats though. But, real estate (direct) investment may not be suitable for every retail investor. Thanks to high-price valuations and low liquidity concerns. Could you please let me know your opinion about RBL bank. Do you think it will do well in near future? Is it safe to invest in a term deposit for 12 months with RBL bank? In case of any bankruptcy, Deposit Insurance and Credit Guarantee Corporation of India (DICGC) can offer amount up to 1 lakh only. So, just wanted to know if its safe to invest a few lakhs with RBL in a term deposit for 12 months as they are providing a very good interest rate of 8%. Indian banking system is a very well regulated one. If your investible corpus is minor (compared to your overall portfolio) then you may go ahead and invest for 1 year. Else, you may stick to popular banks. 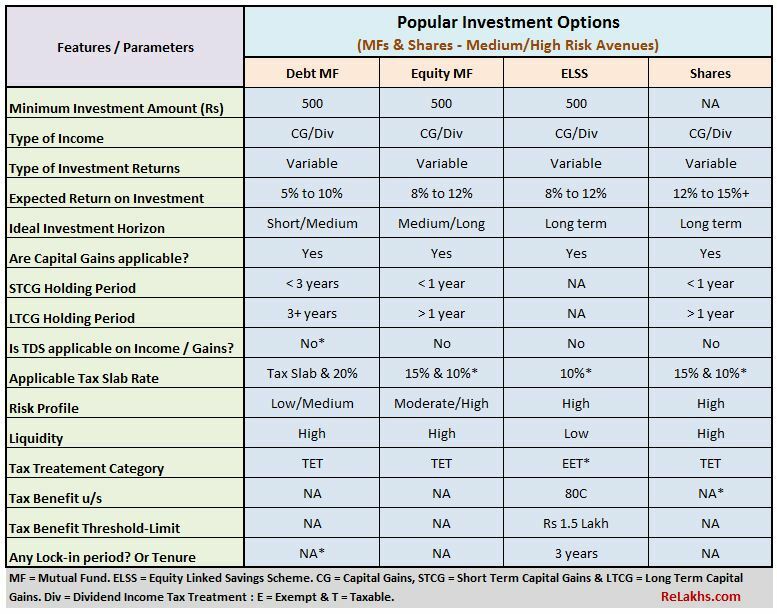 Thank you so much for your efforts you put in preparing this list of all popular investment options in India. Mutual Funds are regulated by Government bodies such as Securities Exchange Board of India (SEBI) and Association of Mutual Funds in India (AMFI). These associations want to make the process of investing in Mutual Funds a household names and the Asset Management Companies aim to do the same. Hence, the chances of a Mutual Fund scheme going bankrupt despite regulations are slight and negligible. You may stick to schemes offered by popular Fund house names..
i am so much impressed with you . i mean you explain everything with so much details. 1. Nice article as usual and always. 2. It will be highly appreciated if for a financial year could be made, as some changes are bound to occur in each FY. In addition–if we could add on the IT sections applicable for various stages. Looking forward for an updated Table for For FY 2018-19. 2 – I have already included the features related to ‘tax implications’ in the tabular data. As when there are changes being proposed in the Financial Budget(s), will surely try to update them. Hope I got your point correctly. You can reach me through the Service-Contact page.. I am regularly reader and follower of your blog. Very nice information . I would like to know more about PMVVY.